I'm thinking tonight is hatch night for mine. Will pull the pot in a couple of hours. Got the Rotifers culturing in a bucket. If I have fry in the morning I'll toss in some Rots and keep my fingers crossed. Well, checked this morning and only a few have hatched. Maybe 6-10 that I can see. Still a lot of fry attached to the pot. I went ahead and put in some rotifers for the ones that hatched. 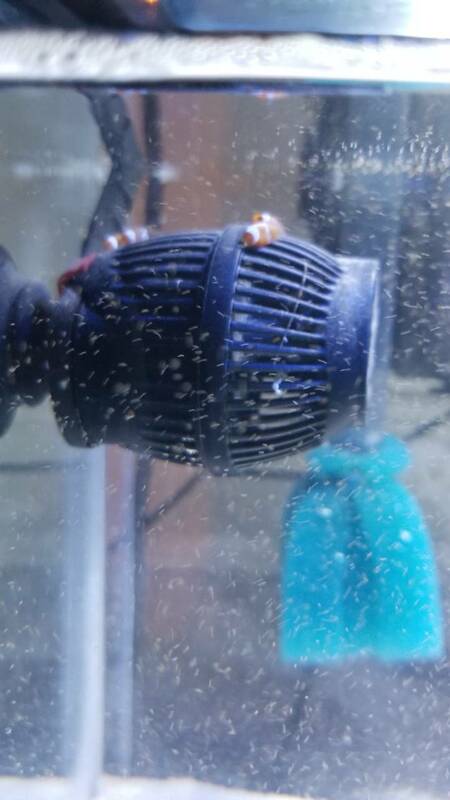 Now have some light in the fry tank so they can see the rots to feed on. Should I leave light on and then blackout tank again tonight to see if the others hatch, or do something different? I think I might try turning off the light tonight for about 2 hrs and see if any others will hatch. Seems I've read that on "hatch night", when lights go off, fry should start to hatch around 1-hours after. Hopefully, 2 hours won't harm the fry that are alive and maybe a few more will hatch. So just moved them to the grow out tank, crazies part they have hosted the wave maker (unplugged) they were laid on. I did the lights out last night for about 3 hours, didn't seem to make a difference. Thought it was worth a shot. Fed them this morning, looks to be around 6 or so fry swimming around. Keeping my fingers crossed. It is puzzling why my hatch rate is so low. Guessing something around only 5% have hatched out of the first 2 clutches. I'm having the same issue, I'll try less bubbles... was worth a shot at least. I'm thinking the same thing myself. Each clutch is approx 100 eggs from what mine are laying, yet seems to be only around 10 or so actually hatch. When I pulled the pot out of the fry tank this morning, you could still see silver eyes as though they were still alive. I guess the next batch I will try less bubbles and maybe even leave the pot in a few extra days if not many initially hatch. I leave the eggs a day, then pull em. I have a lot 25+ hatch, but die off the first 48 hrs is bad. As of this morning, it appears that 5 or 6 are still alive. 2 were swimming around and the others were on the bottom, but did move on occasion. If still alive when I get home this afternoon, I will add a small amount of TDO Chroma Boost - A. Also started feeding the clowns some frozen foods. Mysis & Reef Frenzy. Already had some in the freezer. I read yesterday where some people greatly increased their hatch rate by upping the quality & quantity of food to their clowns. Worth a shot. As of this morning, 2 - are still alive & swimming around. Possibly another one or two, just didn't have much time before work to stare into the tank. It's hard to see them with all the rotifers swimming around. I haven't had to add any rotifers to the fry tank in 2 days, because they are multiplying faster than the fry can eat them, lol. Well, I checked this morning and couldn't find any fry swimming. Might have lost the last couple...I'll check again this afternoon and stir the tank some and if nothing's alive, I guess I will go ahead and get the tank ready for the next batch. I'll keep trying as long as they keep laying, lol. That's what I did, after a few trial and error, you'll get what works best for you. Grats. How old are these fry? No new clutches of eggs for some reason. She laid 2 clutches and nothing for 3 weeks now. Still have my rotifer setup going, which is a real pain since there is nothing to feed them too. Not sure what has happened to prevent her from laying more eggs. Have they started laying again? Nope, wish is okay with me since these guys aren't ready for new homes.